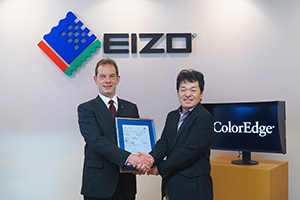 Hakusan, Japan, October 15, 2015 – EIZO Corporation (TSE: 6737) today announced that it is the first company to obtain TUV Rheinland’s Color Accuracy certification with four products in its ColorEdge series of graphics monitors. TÜV Rheinland’s Color Accuracy is the first quality and performance criterion to measure the color accuracy of display devices for multiple graphics fields such as photography, post production, design, and printing. This new criterion will help professional creatives in discerning which monitors meet an established set of requirements for image display. The main requirements of TUV Rheinland’s Color Accuracy are the following. 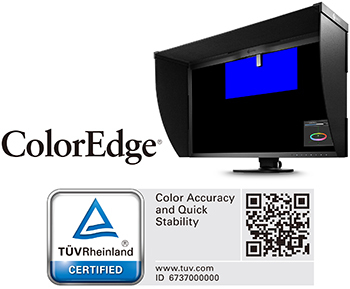 The four EIZO monitors that received TUV Rheinland’s Color Accuracy certification are the ColorEdge CG318-4K, CG248-4K, CG277, and CG247. All four models carry the Quick Stability grade. EIZO and ColorEdge, and are registered trademarks of EIZO Corporation.